Frank Paul Zeidler (September 20, 1912-July 7, 2006) was the forty-first mayor of Milwaukee, serving from April 20, 1948 to April 18, 1960. His successful tenure coincided with the last dynamic period of growth in Milwaukee. While the post of mayor is nonpartisan, he is known as the last Socialist mayor of a major American city. Zeidler graduated from West Division High School at the age of 16. While illness prevented him from completing his undergraduate degree, for the rest of his life he pursued learning at every opportunity. He was a model “lifelong learner.” His career in public service began when he was elected surveyor for Milwaukee County in 1938. He was then elected to two consecutive terms on the Milwaukee School Board, resigning in 1948 to become mayor of Milwaukee. His opponents that year included future Congressman Henry S. Reuss and Mayor Henry W. Maier. 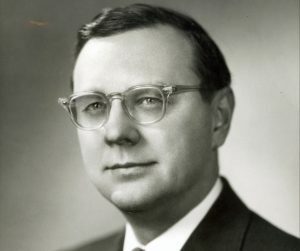 Mayor Zeidler was reelected in 1952 and 1956 but did not seek re-election in 1960. The election of 1948 contained three referenda passed that would guide some of Zeidler’s policy initiatives during his tenure: blight elimination, expressways, and housing. His twelve years as mayor brought many changes. An aggressive annexation policy, designed to bolster the city’s economic development potential, resulted in a doubling of the city’s size. He pushed for the establishment of UW-Milwaukee and the founding of Channel 10, Milwaukee’s public television station. He also had a supporting role in the construction of Milwaukee County Stadium. He pursued development and construction of expressways until that function was turned over to Milwaukee County in 1954. Fiscal responsibility and honesty were hallmarks of his administration, and he was strongly oriented towards collaboration, consensus building, and world peace. His management style and personal attributes were recognized by others. For instance, the American Municipal Association appointed him as its representative to the United States National Commission for UNESCO for six years, and in 1957 Fortune Magazine acclaimed Milwaukee as one of the two best governed large cities in the United States. His last major act as mayor—during his final week in office—was the release of the Inner Core Report, a study detailing social conditions in Milwaukee’s inner city and recommending future actions. During his tenure the African-American population tripled, resulting in increased racial tension. After 1960 he served as a consultant for the Ford Foundation, was a member of the cabinet of Wisconsin Governor John W. Reynolds, worked as a labor arbitrator, and taught at local universities and colleges. In 1976 he unsuccessfully ran for President on the Socialist ticket. He greatly enjoyed explaining the history of Milwaukee to the general public. 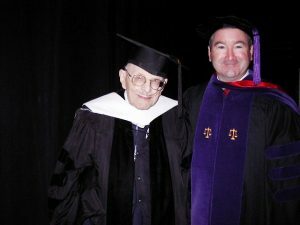 During his distinguished career, Mayor Zeidler received honorary degrees from a number of Midwestern schools, the first from the University of Wisconsin System in 1958 (Doctor of Laws) and the last from Cardinal Stritch University in 2006 (Doctor of Humane Letters). At the latter commencement, on May 21, 2006, he spoke of the need to use technology and science for moral purposes. Frank and his late wife, Agnes, were married 67 years and raised six children. ^ Expressway planning and construction were turned over to Milwaukee County because of the obvious need for a more coordinated (county-wide) approach. Governor Walter J. Kohler, Jr. signed the Wisconsin Expressway Bill (Wis. Stat. 59.965) into law on November 25, 1953, with expressway planning and construction formally transferred from the City of Milwaukee to Milwaukee County on March 26, 1954. Wis. Stat. 59.965 was the statutory basis for the creation of the Milwaukee County Expressway Commission (MCEC), a subunit of Milwaukee County government. Upon hearing the names of the original expressway commissioners appointed by Governor Kohler, Mayor Zeidler said: “I think they should be able to accomplish a very fine job….There were many qualified men in this territory, but I am sure these men, with their composite background in engineering, finance and public life, will be able to meet the knotty problems that will be thrust upon them.” “Expressways’ Backers Laud Kohler’s Choices,” Milwaukee Journal, December 19, 1953. Casey, Jr., James J. Mayor Frank P. Zeidler: Transportation Development in Post-War Milwaukee. Kansas City: American Public Works Association Press, 2006. Zeidler, Frank P. A Liberal in City Government. Milwaukee: Milwaukee Publishers, LLC, 2005. Writing about Frank Zeidler for the Encyclopedia of Milwaukee was an honor and a challenge. An honor because I knew him the last eleven years of his life (1995-2006), and a challenge because much needed to be said. What to put in the entry, and what to leave out? That was my research challenge. Frank was a friend, mentor, and collaborator. We spent many hours discussing politics, transportation, leadership, Milwaukee history, and other diverse topics, including university-industry partnerships. He was remarkably informed. We need more leaders like him. I first met Frank at the suggestion of Dr. Kurt W. Bauer, the long-time, highly regarded executive director of the Southeastern Wisconsin Regional Planning Commission (SEWRPC) and current Executive Director Emeritus. I had been doing some research on regional transportation issues—particularly the freeway program—and Kurt suggested I drill down into city history with Frank. Like Frank, Kurt is of Germanic origin. Frank was raised on the West Side of Milwaukee, and Kurt was raised on the North Side of Milwaukee. During that eleven-year period Frank and I collaborated on different professional pursuits. During the 1990s he often came to my classes at Upper Iowa University in West Allis and lecture about Milwaukee history and social welfare issues. In 2005, he, Arthur Saltzstein (who served as his administrative secretary during Frank’s third term as mayor, as well as an assistant city attorney prior to that), and I wrote a reflection on the 45th anniversary of the 1960 Inner Core Report. The reflection, entitled, “The Inner Core Report: 45 Years Later,” is an appendix in my 2006 American Public Works Association Press book on Frank’s transportation policies and is listed as an additional resource in the main entry above. The Inner Core Report task force was an extensive community effort established by Frank to detail the social, cultural, and physical problems in the “inner city” and recommend steps to counteract these problems. The Social Development Commission (SDC), established several years after Frank left office, was the result. The year 2006 saw the publication of the American Public Works Association Press book detailing his transportation policies. While Frank passed away a couple months before its publication, he read the final draft in its entirety to ensure complete factual accuracy. Since the early 1970s, transportation—and freeways in particular—had regrettably become too much of a political football. The book was designed to provide an objective accounting of his transportation policies and provide an objective counterpoint to a modern narrative in Milwaukee that was at variance with facts during his years as mayor. For instance, the 1990s narrative that the North-South Freeway (I-43) destroyed Bronzeville and other healthy, vibrant minority neighborhoods was simply not true from his vantage point. In a 1999 Milwaukee Journal Sentinel article, Frank characterized this narrative as “bunk.” Bronzeville and other minority neighborhoods were in significant disrepair for years before the freeway, especially when it came to housing and living conditions. The reader is invited to peruse the 1960 Inner Core Report for additional facts. As mayor, Frank approved the location of the North-South Freeway, not only for transportation purposes but also to eliminate truly substandard housing and living conditions. This decision advanced two public policy goals at the same time. As a result, even before I was asked to write the entry, I already had an extensive correspondence file and material. As to the critical question as to what I would cover in a mere 500 words, I decided to focus primarily on Frank’s work as Mayor of Milwaukee and his qualities as a leader and public administrator. Much has been said and written elsewhere about his social justice, humanitarian, and peace efforts, and others may focus on those. The Frank Zeidler Center for Public Discussion at Milwaukee’s Redeemer Lutheran Church, established in 2006, is a fitting legacy. After the ceremony, Frank and I drove around downtown Milwaukee and in the Hillside Interchange area, where he pointed out many interesting facts and the continuing need for the completion of the Northwest Freeway into downtown Milwaukee. From there, we went back to his house, and had a wonderful dinner with his (now also deceased) wife, Agnes, and other family members. Frank and I then went into the front room and talked about politics until maybe 10 p.m. He wanted me to stay longer, but I had to get up for work the next day. I should have stayed—he passed away six weeks later. Shortly after his passing, Agnes told me that he was in extreme pain that commencement day but went through with it because of my role in securing his honor. That was Frank. A final word should be said about Agnes. She was personable and smart and had much to say about the extremely poor conditions of the inner city homes and rental properties taken for the North-South Freeway. She was an equal and stellar partner to Frank. He would not have been as impactful without someone like her beside him. Her key role—success in her own right—teaches all of us a lesson in the process. 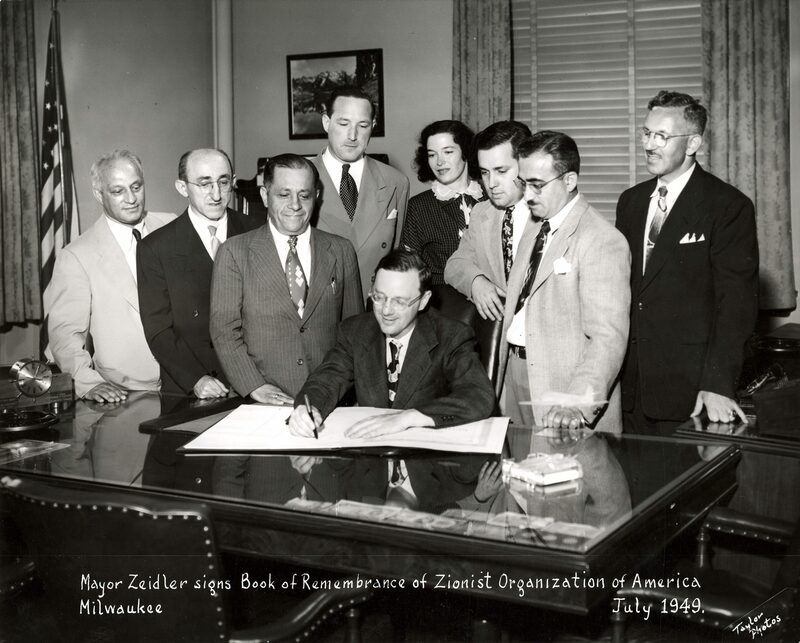 What are the primary issues of the Zeidler era in Milwaukee that merit continued research and discussion today? For me, there are two: 1) the problematic race relations that followed from the tripling of the local African-American population; and 2) rapid annexation of unincorporated lands into the city. Frank was mayor during the last significant period of growth in Milwaukee’s history. An intellectual that found a way to compromise with others who did not always agree with him (whether because of his Socialist affiliation or individuals in the business community), he had a major role in creating contemporary Milwaukee and providing a thoughtful and humane face to municipal governance. While developing this entry, several individuals came to mind that should be thanked. Their contributions over the years informed this entry. Most of these individuals are/were transportation or public policy professionals. A special note of thanks (in alphabetical order) to: Kurt Bauer, Robert Brannan, Herbert Goetsch, Lynn Heis, Daniel Kastenholz, David Kuemmel, Donald Leaman, George McNamara, Arthur Saltzstein, Harvey Shebesta, Ron Sonntag, and Anita Zeidler. I am reminded at this point that there is still much more to say about Frank’s three terms as mayor and his professional and personal qualities. That too is testament to Frank as a leader and humanitarian. ^ Mayor’s Study Committee on Social Problems in the Inner Core area of the City: FINAL REPORT to the Honorable Frank P. Zeidler, Mayor, City of Milwaukee (January 15, 1960; Milwaukee Legislative Reference Bureau). ^ James J. Casey, Jr., Mayor Frank P. Zeidler: Transportation Development in Post-War Milwaukee (Kansas City, MO: American Public Works Association Press, 2006). ^ “Road Kill,” Milwaukee Journal Sentinel, November 10, 1999, p. 2.